Today, the Terrier Hockey Fan Blog launches a new feature to expand your involvement with Boston University Hockey. Coach Jack Parker has agreed to answer questions submitted by readers in a "coach’s mailbag" column, which we will periodically post. Here’s the process. Submit questions by e-mail to thfblog@comcast.net. They'll be forwarded to the coach in batches and every few weeks—the frequency is still TBD—we’ll publish questions and replies on the blog. Questioners will be identified by their e-mail ID unless they choose to provide a real name. Obviously not all submitted questions will receive responses. There are bound to be some redundancies and, as is the case with live chats, inappropriate questions will not be passed along for a reply. And Coach Parker just might have some other demands on his time. In other BU hockey news…. Another former Terrier, Shawn Bates, played in an NHL game last night for the first time since January 30, 2007 due to lingering abdominal injuries. In the Islanders’ 3-2 win over Ottawa, teammate and fellow ex-Terrier Rick DiPietro was the game’s top star, stopping 35 shots in regulation and five of six in the shootout. Yesterday, a conference call with all ten Hockey East head coaches was held with the media. Transcripts of each coach’s responses are accessible at the HockeyEast Online site. Coach Parker’s comments. Coach Parker also appeared on the season’s inaugural “Hockey On Campus” radio show along with sophomore center Luke Popko. Parker related that former BU defenseman Peter Ahola was in New York on business last week when he learned about the game at MSG. He asked the concierge at his hotel about getting a ticket and was advised it would cost $350. Ahola wisely opted instead to use his team connections to secure a ticket. Popko was asked about the thrill of scoring a goal on the Rangers' home ice and the Jerseyan reminded host Bernie Corbett that he is a Devils' fan. Andrew Glass, after a strong fall season with Cape Cod Whalers U18s, began his final prep school season at Noble & Greenough, scoring a goal and two assists in the first period to lead his team to a 4-2 win over Pomfret. Dave Warner, a defenseman for the Terriers’ back-to-back national championship squads of 1970-71 and 1971-72, played an important role in wins against Wisconsin and Cornell in Boston Garden that earned BU its second crown. BU primarily used two sets of blueliners at the time, with Warner being the fifth defenseman in '71-'72. After BU’s ECAC title win, Coach Jack Kelley learned he’d be without steady defenseman Bob Murray in the NCAAs due to a kidney injury. Kelley petitioned the NCAA to allow freshman Vic Stanfield to be added to the varsity roster for the nationals, but it was Warner who saw most of the action in Murray’s place, helping goalie Tim Regan keep his net empty, save for one Badger goal, in the two games. We’d like to also take this opportunity to thank the many former BU players and coaches who contributed their recollections to the two feature articles (BU In The Big Apple and Red Hot Hockey Since 1925) that were posted last week and listed among the “Terrier Tales.” Those articles also were included in the press packet that BU’s Senior Assistant Director of Athletic Communications Brian Kelley provided to the media this past Saturday at Madison Square Garden. While BU fans from New England and the tri-state area were making a bee-line to Madison Square Garden on Saturday evening, Kevin Shattenkirk's parents, Pat and Barbara, had an afternoon stop on their itinerary. With CSTV.com Rink Rat Elliott Olshansky bumming a ride, they first headed to Quinnipiac in Meriden, Conn., to watch their older son, Keith, skate for Princeton in a 4-2 win against the Bobcats before racing down to Manhattan for Red Hot Hockey at MSG. Olshansky’s chronicle of the road trip, with three video interviews sprinkled in, is found in his latest blog entry. CSTV.com also has posted video highlights showing four of BU’s six goals against The Big Red. WWZN-AM (1510-The Zone) will again air “Hockey on Campus,” a two-hour, weekly program on local anad regional college hockey, hosted by longtime Terrier play-by-play voice Bernie Corbett and Paul McNamara. The 2007-08 season for the drive-time program begins tomorrow, Nov. 28. The first program, beginning at 5 P.M. will be a live remote from T’s Pub on Commonwealth Avenue. At 6:00 p.m., Coach Jack Parker and one or two of the Terriers, will arrive at T’s and join Bernie and Paul. BC Coach Jerry York will be a phone-in guest at 6:30 p.m. The program also is accessible on the WWZN Web site. Back to CSTV.com which today held a Writer's 'Roundtable discussion about the season to date. The full transcript is here and we’ve culled out a few of the BU-related comments. Brandon Thomas, Ithaca Journal: If Brett Bennett continues to play like he did Saturday, BU won't have many problems. For a game with nine goals, there was some great goaltending at MSG. Dave Starman, CSTV: You are very correct...Scrivens would love to have (Joe) Pereria's goal back, that was the weak link and it opened the flood gates. Dave Starman: BU looked like Cornell in their approach...attack the net and shoot when possible. Dave Starman: Offensive minded defensemen can change a game. One of the best was Peter Harrold at BC. Then again, name me a better offensive defensemen than Matt Gilroy, and he will continue to improve because his instincts are just so good. Brandon Thomas: Matt Gilroy was fantastic on Saturday. Dave Starman: Gilroy spends more time in front of the other net than his and yet he's a very good defenseman. Starman also included Colin Wilson among the top freshmen he’s seen this season. Freshman Joe Pereira’s goal and assist against Cornell earned him Hockey East’s Rookie of the Week honors, while Pete MacArthur made the weekly honor roll. MacArthur also earned The Boston Herald’s college hockey “Tip Of The Hat” for his efforts in the Harvard and Cornell games. Too bad the Herald got the Red Hot Hockey score wrong and never published a game account. CSTV Rink Rat Elliott Olshansky’s look back at some of the special off-ice moments included this exchange between Pereira and Coach Parker. It was similar later on, when BU freshman forward Joe Pereira, talking about scoring his first career goal in Madison Square Garden, said, "I'm not a regular player," and before he could finish talking about working hard every week in practice, Jack Parker cut him off and said, "You are now, Joe," to a hearty laugh from the crowd in the press room. It was a typical Jack Parker press conference remark, and it happened in Madison Square Garden. Legndary BU Coach Jack Kelley and his wife Ginny were among the couples featured on the MSG Kissing Cam during a timeout, eliciting a roar from Terrier fans. But not all the reports surrounding the Red Hot Hockey game were positive. Message board posters were critical of errors of fact and omission on CSTV’s graphics during the game broadcast. And CHN editor Adam Wodon pointed out that CSTV has had even more problems, leading it to canel some scheduled games--including this Friday's BU-BC game at Conte Forum. In particular, the game Saturday was televised, but was done so using the in-house MSG video feed. The regular broadcasters, Matt McConnell and Dave Starman, were not at the event, but rather called the game off video monitors from CSTV's studios about a half-mile away from the Garden. It's one thing to use another organization's video feed, not an uncommon practice. But not to not have your play-by-play guy and analyst in the building is rarity that explains the broadcast quality issues and accounts for some of the mistakes and eyebrow-raising observations by the broadcast team. While the Terriers were performing on the big stage in Manhattan, two 2008 recruits were leading the NTDP U18s to an 8-3 win against host Colby College, which is where Kelley began his coaching career in 1955. David Warsofsky contributed a pair of goals and Vinny Saponari added a pair of assists. In two OPJHL games, Stouffville teammates and BU recruits Corey Trivino and Ethan Werek each recorded a goal and three assists. Trivino, who returned to action after being sidelined by a shoulder injury, now has 14 points in his past five game. Just a few hours until BU and Cornell face off at Madison Square Garden. Game notes are available and BU has posted links to the two special feature articles that were posted on The Terrier Hockey Fan Blog earlier this week. Also, blog contributor mh82 spotted this reference to the BU-Cornell rivalry in a passage from Ken Dryden's book, "The Game." "As a senior at Cornell, I was co-winner of Boston University's "most honored opponent" award, given for games against BU through a college career. Though I had won other, more prestigious awards, it was one that meant much to me, for BU had meant much to me as a player. Our closest Eastern rival, they were the necessary other side in many of my most fundamental monments, the inspiration and competitve prod for them, irrevocably and fondly associated with them. My first season, starting because of an injury to the team's senior goalie, I played through several promising but undistinguished games, on the verge of something more, yet timorously waiting. After a 3-3 double- overtime tie with BU, I suddenly felt I could make it the way I wanted to make it. I had broken through. A few months later, we played twice within a week: in the first period of the ECAC final, I survived great pressure to learn something about myself I needed to know; then, during the warm-up for the NCAA championship game, feeling skates, pads gloves, and stick move the way they never did, I could feel myself a real goalie for the first time. There were other games other years with lesser BU teams, not quite good enough to expose new strengths or weaknesses in us, but good enough to make us confirm what was already there, which games against other teams seldom did. What BU was, what the Bruins are now, is a good opponent, a rare and treasured thing for any team or player. For a good opponent defines a player or a team. By forcing you to be as good as you can be, such an opponent stretches the boundaries of your emotional and playing experience, giving you your highest highs and lowest lows; your best and worst and hardest moments. When you get to an age or to a moment that causes you to look back, you realize how important that is. After years of games and feelings, it is only those boundaries, those special highs and lows, that remain." If you tried unsucessfully to access the "BU In The Big Apple" article via the link in yesterday's "Red Hot Hockey" post or the link under "Terrier Tales," we've now fixed the problem. Either link will take you to a new Web site for original articles developed for the blog. You'll see the article title and can click on it to view the article. With the BU-Cornell game at Madison Square Garden just days away, The Terrier Hockey Fan Blog offers several special historical articles. The first, “BU in the Big Apple” looks at the previous eight Terrier games played at Madison Square Garden III and Madison Square Garden IV—the current venue—beginning with an exhibition game in 1926 against the St. Nicholas Hockey Club and continuing with three ECAC Holiday Festival appearances. The article, prepared by blog contributor mh82, is posted under “Terrier Tales” in the sidebar to the right and you also can access it from this link. Look at the price on your game ticket for Saturday. When Madison Square Garden held its first hockey games in 1925, the price of admission was 15-cents. 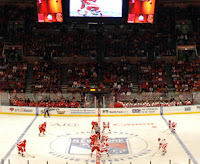 In case you missed it earlier this month, here’s a link to a history of Madison Square Garden. We'll post links to another original article, this one looking back at memorable BU-Cornell clashes, later this week. And please check back for the announcement of an exciting new feature on The Terrier Hockey Fan Blog. Also related to the Red Hot Hockey game at MSG, we've been asked to report that there will be a gathering of BU fans, alumni and other supporters following Saturday night’s game at “Professor Thom’s” located at 219 Second Avenue (between 13th and 14th). Our sources say this is a BU friendly spot that can accommodate a fairly large crowd. The game is no longer a “virtual” sellout; Cornell has announced that all seats have been sold. Tomorrow afternoon, before taking the ice against Harvard, senior wing Pete MacArthur, tied for second in scoring on the team with 12 points, will answer questions in a CSTV chat. The annual Tuesday before Thanksgiving meeting with Harvard will be the 139th in the series—and second at Agganis Arena— with the Terriers holding a 71-61-6 edge. The Daily Free Press reports that senior Karson Gillespie, who relieved Brett Bennett in goal in Saturday's loss to Vermont, will get the start against the Crimson and that Craig Sanders will center the third line, replacing John McCarthy. Go figure. Former BU captain Sean Sullivan has left the state of Arizona, but it brings him that much closer to Phoenix. Sullivan who began the season with the CHL Arizona Sundogs was promoted to the AHL San Antonio Rampage. In 13 starts with the Sundogs, Sully racked up 4 goals and ten assists. He was a 9th round draft choice of the Coyotes in 2003. John Curry also made the jump to the AHL, joining the Wilkes Barre-Scranton Penguins after six games with the Las Vegas Wrangers and a strong performance for Team USA in the Deutschland Cup. Sunday night, Curry stopped 22 of 24 shots, but the Pens fell to Binghamton, 3-0. Saturday, while the Terrier were letting two points slip away up in Burlington, some former BU standouts were hitting the score sheet in AHL games. Chris Bourque, after a few starts with the Capitals, returned the AHL Hershey Bears and registered a two-goal game in a win over Bridgeport, which got a goal from rehabbing Shawn Bates. David VanderGulik scored for Quad City its 6-0 win over Iowa while Mike Pandolfo found the back of the net for Lowell in a 3-2 loss to Harford. Last night’s 9-1 win over Vermont in Burlington sent BU Sports Information Director and the journalists looking into the record book for the last time BU had such a lopsided road win, which the Daily Free Press addressed. The answer is a 1989 8-0 blowout at Merrimack. BU last hit a 9-spot in the 2005-06 post-season in wins over New Hampshire and Nebraska-Omaha. With the Terriers flexing their offensive muscles, Colby Cohen scored his first college goal, Chris Higgins had his first non-ENG goals and Bryan Ewing had a goal and three assists to become, for now the top point scorer in Hockey East. Tonight’s rematch is only available on radio which can be accessed at the WZZN site. Omaha left wing Chris Connolly, another 2008 recruit, scored a goal in regulation and another in the shootout to help the Lancers edge the Chicago Steel and 2009 recruit Max Nicastro 2-1. Wrapping up last week’s Four Nations Tournament in Huttwil, Switzerland, the NTDP U18s lost to the host team in the finals. In the team’s 6-5 win over Finland, 2008 recruit Vinny Saponari had a goal and two assists and now the second leading scorer on the team with 5-8-13. He was assisted on his goal by David Warsofsky. With NJ Devils goalie Marty Brodeur seeking his 500th career win Rick DiPietro stopped all 26 shots he faced and outdueled Brodeur for a 1-0 Islander win. The only goal came on a shorthander when Devils defenseman Mike Mottau fell down, allowing a breakaway. The men's and women's basketball teams take over Agganis Arena today, with the men's game against St. Joseph's airing tonight on CN8 in both the New England and MidAtlantic regions. Finally, a good read on CSTV.com: astute hockey analyst Dave Starman takes a look at college hockey’s greatest rivalries. The forward momentum the Terriers gained with last week's pair of wins was blunted last night by Toot Cahoon's hustling UMass squad, which scored the tiebreaking goal with about six minutes left and then an ENG for a 5-3 final. Pete MacArthur scored a pair for BU. The NTDP U18s fell by the same score, 5-3, to Sweden in the first game of the Four Nations Tournament in Huttwil, Switzerland, despite a goal and an assist each for 2008 recruits Vinny Saponari and David Warsofsky. The U18s next take on Finland. Another 2008 recruit, Omaha left wing Chris Connolly, enjoyed a three-point night (G, 2A) in the Lancer's 4-2 win over Cedar Rapids in USHL play. Connolly remains the USHL's top point scorer with 8-1-19 in 11 games. The Daily Free Press reports that Coach Jack Parker has decided to go with one goalie, sophomore Brett Bennett, getting the starts, for now, explaining. “"We're not in a rotation anymore. We're just going to see how Benny goes and see what happens after that." That begins tonight when ex-Terrier Don “Toot” Cahoon brings the UMass Minutemen to Agganis Arena. The Terriers second game of the weekend is Saturday night against Northeastern at Matthews Arena. INCH’s weekly HE column looks at Coach Greg Cronin’s Huskies, now considered a serious challenger for home ice in the conference playoffs. USCHO columnist Dave Hendrickson’s weekly HE report is up, too, complete with game predictions. Terrier game notes are now available for tonight's 7:30 start. Gametracker is available, as are the All Access service for watching the game and the WWZN broadcast. All three Terrier recruits playing in the World Junior A Challenge have advanced to the tournament semifinals tomorrow. CanadaEast (Corey Trivino, Ethan Werek) plays Russia, while Team USA (Max Nicastro, photo) takes on CanadaWest). Former BU All-American goalie John Curry’s 36-save performance led Team USA to a 3-2 win over host Germany in the Deutschland Cup tournament in Mannheim. Curry, no stranger to close, low-scoring games, stopped 17 shots in the 3rd period and was named U.S. player of the game. He held Germany to one powerplay goal until late in the third period when a two-man advantage for the hosts became a 6-on-3 with the goalie pulled. Team USA next takes on Denmark. The NTDP U18s 2008 recruits Vinny Saponari and David Warsofsky) take on Sweden today in the Four Nations tournament in Huttwil, Switzerland. When the Rangers and Islanders clashed last night, Chris Drury drew first blood, beating Rick DiPietro with a one-timer from the point to give the Blueshirts a 1-0 lead, but DiPietro would have the last laugh, backstopping his team to a come from behind 3-2 win. His 28 saves included four subsequent Drury shots and a bushel of spectacular stops. For his part, Drury did some moonlighting in the Rangers’ crease, dropping to his knees to block a shot when the Rangers’ goalie was out of position. Thoroughly enjoyable hockey. Links to the game summary and video highlights are here. Elsewhere in the NHL, Washington called up ex-Terrier Chris Bourque from Hershey to join Tom Poti in the Caps’ lineup. Bourque, who wore #56, skated on the Caps’ first line with Alex Overchkin and Michael Nylander, registering two shots and two penalty minutes in nearly 12 minutes of ice time. In an NHL.com feature, Bourque explains that he spent the summer at BU strength and conditioning coach Mike Boyle's gym to get himself in the best possible shape. Three Terrier recruits—Corey Trivino, Ethan Werek, and Max Nicastro— are in action tonight when CanadaEast plays Team USA in the second round of the World Junior A Challenge in British Columbia. Nicastro had an assist for Team USA in its 7-6 OT win over Belarus. The NTDP U18s, including 2008 recruits Vinny Saponari and David Warsofsky, are about to embark on their first overseas trip, heading to Switzerland for the Four Nations Tournament. Finland, Sweden and host Switzerland are the opposition. Live in-game statistics will be available through the Swiss Ice Hockey Association's web site . Terrier freshman Colin Wilson is ranked #20 among 2008 draft prospects by McKeen’s Hockey. ISS Scouting currently ranks the 6-1, 215 pound forward at #9. Hockey East has extended the contract of Commissioner--and former Harvard goalie--Joe Bertagna through 2011. The WTBU Sports Blog points out that Saturday’s seven goals scored is the most a BU team has registered at Agganis Arena since moving over from Walter Brown Arena on Jan. 3, 2005. It also was the most goals scored by BU in a game since the 9-2 route of Nebraska-Omaha in the 2006 NCAA tournament. The last time BU scored seven goals in a home game? Nov. 30, 2003, against Yale. WTBU also reports that Coach Parker expects Brandon Yip to return to the lineup for Friday’s home game against Don “Toot” Cahoon’s UMass Minutemen. Freshman Nick Bonino (photo) was Hockey East’s Rookie of the Week for his goal and two assists in the wins over Providence and UM-Lowell. Brett Bennett and Luke Popko were named to the list of top performers. Former BU goalie John Curry takes a brief break from the ECHL Las Vegas Wrangers to put on a Team USA sweater. He was named to play for the U.S. in the Mannheim Cup in Germany this week. Normally, the American team is made up of only U.S. players who are on European teams, but this year, Curry, who has a 4-1 record for the Wranglers, was invited, as was University of Minnesota forward Mike Carman who is academically ineligible this semester. The other participants in the tournament are Germany, Denmark, Slovakia and Switzerland. USA takes on Germany this Thursday. We’ve reported on David VanderGulik, now with the Quad City Flames, and Brad Zancanaro, back in Florida with the Everblades. So where is their Terrier classmate and linemate John Laliberte? He’s in Augusta, Ga., playing for the ECHL Lynx. Jay Pandolfo's first pro hattrick, which we posted about last week, became the lead topic in Kevin Dupont's Hockey Notes column in this past Sunday's Boston Globe. COREY TRIVINO; An offensive leader…is a leader in both ends of the ice…has a great combination of skill and explosive speed…a dynamic playmaker, he continually sets his teammates up for scoring opportunities…sees the ice extremely well and has great offensive imagination…strong athlete…has committed to Boston University for the 2008-09 season…could be an early-round NHL draft pick. Trivino is off to a strong start, firing a short-handed goal for the game-winner, adding two assists and earning playerof-the-game honors in CanadaEast's 4-1 win over Belarus in first-day action. The game recap described the 6-1 left shot center's goal as "a spectacular solo effort, splitting the defence and beating Belarussian goaltender Vitali Trus on a deke, sliding a backhand into a wide open net." Looking for college games on the tube? Here's a Hockey East schedule of televised games. The College Hockey Live site includes telecasts of all D1 teams. The Terrier scored six unanswered goals—five in the third period—to come roaring backing from a three-goal deficit for a 7-4 win over UM-Lowell last night. After replacing a struggling Karson Gillespie (3 goals allowed on 6 shots) in goal early in the middle stanza, the Terriers took control led by sophomore center Luke Popko’s two goals, a pretty breakaway goal and a well earned assist by fellow second-year player Zach Cohen (whose efforts Jack Parker termed “a coming out party") and a strong relief effort in goal by Brett Bennett. It was a strange game: despite falling behind by three goals, the Terriers enjoyed a huge territorial advantage and most of the best scoring. But BU made about half a dozen critical errors in the first 25 minutes and four of them ended up in the net. --The Dog Pound was in fine form providing some extra motivation for the Terriers to keep working, even when trailing by three goals. --Zach Cohen’s work along the boards all night, but especially preceeding Popko's first, was exceptional. He didn’t earn an assist on Popko’s second, but credit him with hard work to step his up, with a big assist, no doubt, to Mike Boyle. When Brandon Yip , who missed the game with a groin injury, returns, each of the Terriers’ four lines will have a strong physical presence and Popko and Cohen get Lawrence's skill back with them. Colin Wilson continues to shrug off defends while maintaining puck control in the offensive zone. --Besides his steady play in goal, Bennett impressed with his DiPietro-esque head man passes. In 99-00, the Ricky-to-Corazzini combo produced a bunch of breakaways and many scoring chances, regularly bringing Terriers fans to their feet. --Looking at the two scoresheets for the week, BU really spread out the offense. Ten different players had goals with only Weston scoring in both games--and he nearly had a third, hitting the post. Eight players who didn't score goals did have assists, including Bennett. Every forward except Yip and Lawrence was on the scoresheet. Speaking of DiPietro, he started in goal last night in the Islanders 3-2 win over the high-octane Penguins, with Al Arbour coming out of retirement to coach his 1500 NHL, behind the Fishticks’ bench. DiPietro stopped 12 of 13 shots before leaving the game with an eye injury that isn’t considered serious. Ex-Terrier Justin Maiser, now with the Phoenix Roadrunners, is the top goal scorer in the ECHL with six, going into this weekend’s games. On Thursday, he scored two of the three Phoenix goals, including the game-winner, in a 3-2 win over Fresno. 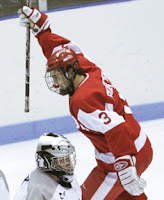 Maiser, spent last season with the Dayton Bombers, displayed a penchant for game-winners as a Terrier, including his double-over time goal against BC in the 2003 Hockey East tournament semi-final, which completed a hattrick. 2008 recruit Chris Connolly remains atop the USHR scoring chart with 7-9-16 in nine games, following a one goal/one assist effort in Friday’s 8-0 drubbing of Chicago by Omaha. The left winger from Duluth has at least one point in eight consecutive games. One of BU hockey’s many international fans will be at tonight’s game against Lowell. Longtime Terrier hockey follower Dr. Alastair Strain, a professor at the University of Birmingham Medical School in England, who keeps tabs on the Terriers via the Internet, makes an annual visit to Boston to catch a game in person. A possible answer to the Terriers’ scoring woes: feed them whatever Jay Pandolfo had for dinner before Wednesday night’s game against Tampa Bay at the new Prudential Center. Pando’s first pro hattrick got the Devils’ struggling offense untracked in a 6-1 win (video link in game recap). The 1995-96 BU captain scored on a goalmouth pass, a hard wrister from the left circle and a nifty deflection of a slapshot. He also assisted on a goal by longtime linemate, John Madden. Pandolfo was on fire all night generating six shots on goal, with two shorthanded bids barely turned away. As Pando’s point total grew (he’s currently the Devil’s top goal scorer), commentator Glenn Resch reminded viewers that Jay had scored 38 goals in 40 games as a BU senior. That total, third best in Terrier history, included five hattricks, one entirely shorthanded. And now he’s in the Devils’ record book with the first hattrick at The Rock. Fellow 2008 recruit Vinny Saponari’s eight points make him co-leading scorer of the NTDP U18s.